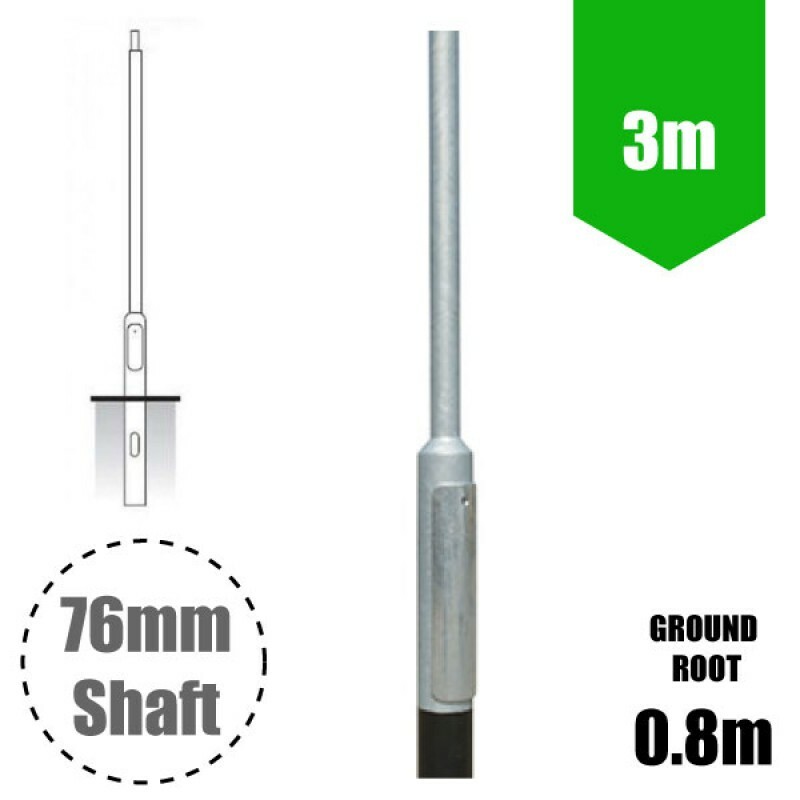 Lighting Column 3m - Steel Galvanised Tubular Street Lamp Post (76mm Shaft / 140mm Base) - 0.8m Root Mounted. c/w with door (500mm x 100mm) and wooden backboard/ Column Weight 32kg.Maximum head load ( Kg/m2 ) = 50 /0.5 for terrain category 3. Lighting column designed to BSEN40, PD6547 : 2004 + A1:2009 Hot dipped galvanised to BS EN ISO 1461:2009. 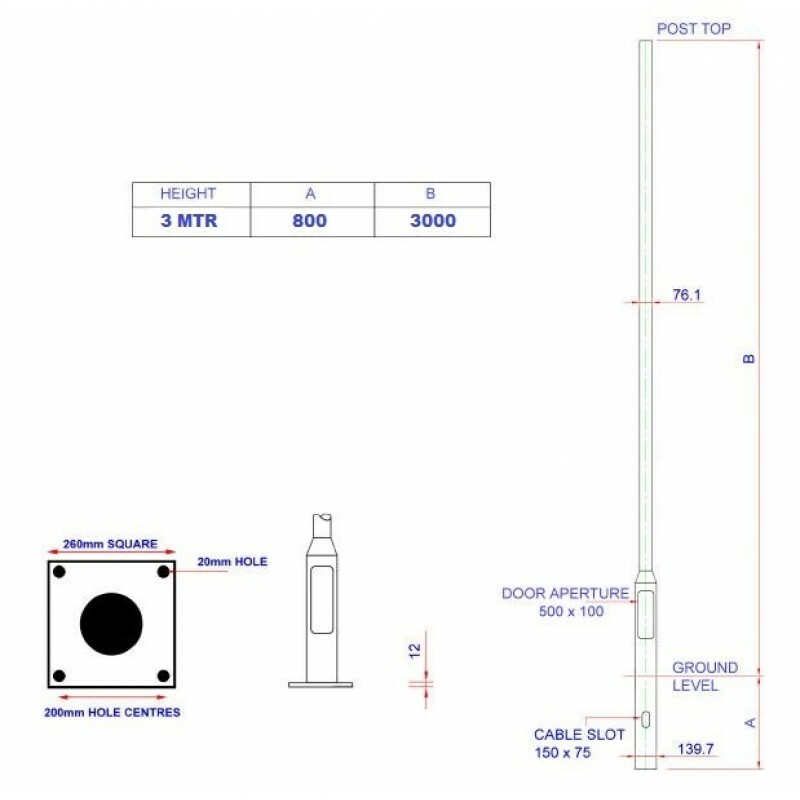 Manufactured in steel tube to EN10210.Standard duty lighting column suitable for road, residential, CCTV/security features and general amenity areas, with street lanterns, floodlights & post top amenity luminaires ( please see related accessories). PLEASE NOTE - Weight & Windage must be checked for suitability of the column against the installation postcode. Please email us for more information prior to purchase. It is the responsibility of the installer to ensure columns are installed safely and correctly, no liability will be accepted by The LED Store/supplier. In certain cases a ground survey may be required prior to installation. /supplier. In certain cases a ground survey may be required prior to installation. Unit does not include the column door key. Please see the link to this product below. Lighting Column Bracket - Single Floodlight Bracket - Steel Galvanised Post-Top for 76mm Shaft colum.. Lighting Column Bracket - Twin / Double Floodlight Bracket - Steel Galvanised Post-Top for 76mm Shaf.. Lighting Column Arm - Single Projection Bracket 500mm Bracket - Steel Galvanised Post-Top for 76mm S..
50W / 6500lm - Direct Replacement for 150W SON / 70W MHL Metal Halide Now with 5-year Warranty! An ..
180W Dimmable LED Flood Light (1-10V) Utilising our advanced design aluminum multi-fin heat sink sy..